Dialysis injury attorneys of McSweeney / Langevin are providing free legal consultations to individuals and families injured or harmed as a result of dialysis treatment involving GranuFlo or NaturaLyte. Give us a call or use our private contact form. 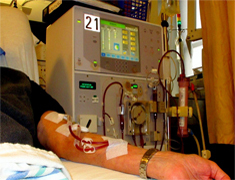 Fresenius Medical Care products, GranuFlo and NaturaLyte, are chemicals used in dialysis machines to help clean blood. Granuflo and NaturaLyte contain a substance called bicarbonate. Bicarbonate is used to prevent a buildup of acid in the blood. However, GranuFlo and NaturaLyte may contain more bicarbonate than rival products. An overdose of bicarbonate can lead to cardiac arrest and possibly death. Many victims received Granuflo and NaturaLyte at DaVita or Fresenius dialysis. Together, the two companies control roughly two-thirds of the dialysis market in the United States. These symptoms and side effects will usually occur during dialysis or shortly thereafter. However, Fresenius did not address the issue “urgently.” In fact, Fresenius failed to immediately inform the Food and Drug Administration of dangers associated with GranuFlo and NaturaLyte. Fresenius only warned the public of the safety risks and dangers of GranuFlo and NaturaLyte when an individual sent an anonymous copy of the internal memo to the FDA. The FDA has classified the Granuflo and NaturaLyte recall as a Class I recall because of the potential risk of serious injury or death. Did You or a Loved One Experience Any of the Dialysis Related Symptoms or Injuries? Please feel free to contact a McSweeney / Langevin Granuflo attorney at 1-877-542-4646. If you prefer, use the form below. A GranuFlo lawyer will evaluate your claim for free and contact you shortly. Thank you. Our GranuFlo and NaturaLyte attorneys handle cases throughout the entire United States: Alabama, Alaska, Arizona, Arkansas, California, Colorado, Connecticut, Delaware, Florida, Georgia, Hawaii, Idaho, Illinois, Indiana, Iowa, Kansas, Kentucky, Louisiana, Maine, Maryland, Massachusetts, Michigan, Minnesota, Mississippi, Missouri, Montana, Nebraska, Nevada, New Hampshire, New Jersey, New Mexico, New York, North Carolina, North Dakota, Ohio, Oklahoma, Oregon, Pennsylvania, Rhode Island, South Carolina, South Dakota, Tennessee, Texas, Utah, Vermont, Virginia, Washington, West Virginia, Wisconsin and Wyoming. Our GranuFlo and NaturaLyte attorneys handle cases in the following cities: New York, Los Angeles, Chicago, Houston, Philadelphia, San Diego, San Antonio, Dallas, San Jose, Detroit, Jacksonville, San Francisco, Indianapolis, Austin, Columbus, Fort Worth, Charlotte, Memphis, Baltimore, El Paso, Boston, Milwaukee, Denver, Seattle, Nashville, Washington, Las Vegas, Portland, Louisville, Oklahoma City, Tucson, Atlanta, Albuquerque, Fresno, Sacramento, Long Beach, Mesa, Kansas City, Omaha, Cleveland, Virginia Beach, Miami, Oakland, Raleigh, Tulsa, Minneapolis / St. Paul, Colorado Springs, Honolulu, Arlington, Wichita, St. Louis, Tampa, Santa Ana, Anaheim, Cincinnati, Bakersfield, Aurora, New Orleans, Lexington, Pittsburgh, and Buffalo.